In its worst single day in over four years, crude oil prices continue to fall, taking shares of these oil stocks down by double digits. Shares of California Resources Corp (NYSE:CRC), Chaparral Energy Inc, Noble Corporation PLC (NYSE:NE), Oceaneering International (NYSE:OII), and Weatherford International plc (NYSE:WFT) all ended trading on December 20 down by double digits. The big driver for all five of these oil-related companies was the huge sell-off in crude oil futures. Two of the world's most important crude oil benchmarks fell more than 4% on the day. West Texas Intermediate, a key benchmark for U.S. oil, fell 4.1%, while Brent, the North Sea benchmark that represents more oil than any other global price for crude, finished the day down 4.4%, making Dec. 20 the biggest single-day decline for oil markets since late 2014, when oil prices were a few months into what would become one of the worst oil downturns in years. Crude oil prices continue to fall on concerns about an oil glut and fears that global oil demand could weaken as we head into 2019. In addition to that, a looming trade war between the U.S. and China and deceleration of economic growth in some parts of the world have caused oil investors to turn decidedly negative in recent months. If we go back to the 2018 oil price peak of $86.29 on October 3, Brent crude prices have fallen by 37%. On one hand, investors shouldn't read too much into a single day's movement in any commodity price, but it's pretty clear that there's an oversupply of oil right now. But unlike the last time oil fell 4% in a single day in late 2014, the fundamentals of supply and demand appear to be much healthier today. At that point in 2014, crude was only a few months removed from trading for triple digits and OPEC's approach at the time was closer to a game of "chicken" with other global producers, like the U.S. and Russia. In other words, the oil kept pumping for some time, which led to a massive global oversupply that saw crude prices fall well below $30 in early 2016. Today, OPEC is taking a very different approach. It cautioned many months ago that while the market was fearing a shortage, the bigger risk was an oversupply. The Saudi Arabia-led cartel has proven absolutely right, but unlike in 2014-2016, when it kept on pumping, OPEC said it would cut production starting in 2019, helping to restore balance to the supply side. Back to the five companies above. Of this group, Weatherford International is the only one I'd call truly troubled. It's on the brink of insolvency and looks increasingly like it will have to resort to bankruptcy proceedings. 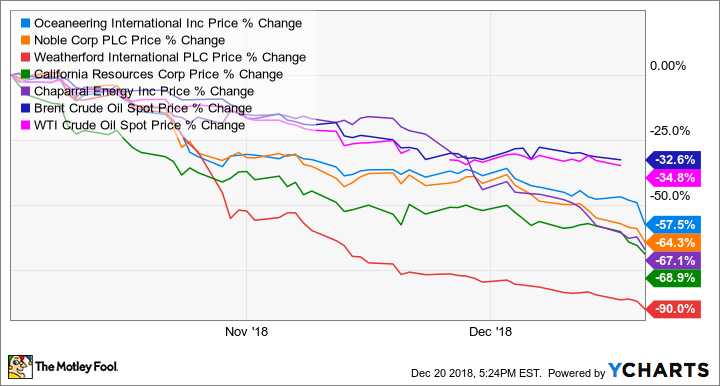 So before you decide that the $0.25 per-share price looks attractive, it's important to know that if it does file for bankruptcy, common shareholders would almost certainly be wiped out almost entirely. It's possible the company recovers without filing, but I think it's unlikely at this point. There's no doubt that oil producers Chaparral Energy and California Resources both would benefit from higher oil prices. Chaparral owns a fair amount of lower-cost production in the STACK play, but California Resources, frankly, needs higher prices to thrive. For Oceaneering International and Noble Corp, the answer isn't so straightforward. As providers of offshore services to oil and natural gas producers, they get an indirect benefit from higher prices, which can increase the incentive for producers to invest in developing offshore resources. 2018's price recovery started pushing some money back offshore, and that recovery is set to continue in 2019. At the same time, however, if oil prices don't start to turn higher in the near term, it will be harder and harder for producers to justify future investments. Offshore oil can be very profitable but take years and years to develop, so producers need some measure of certainty in cash flows from their existing production before committing to these projects. To put it plainly, Noble and Oceaneering International are two of the top operators in what they do, but it could take some time for investors to start seeing the upside, particularly if the oil market remains oversupplied.